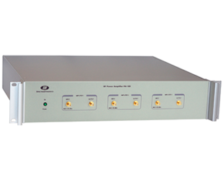 The DA100 is a wide band general purpose isolation amplifier designed to distribute frequencies from 0.3 MHz to 200 MHz. 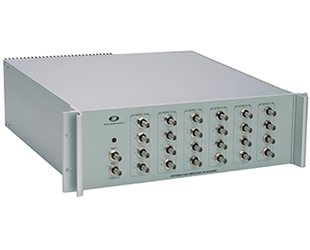 The DA100 is the low cost solution for reference frequency distribution. The exceptionally low phase noise of -156 dBc/Hz at 10 Hz, and –163 dBc/Hz for the noise floor ensures that your reference signals are not degraded. The input and outputs have low VSWR to minimize environmental effects on frequency distribution through long transmission lines. The inputs are chassis grounded and all outputs are DC isolated. The standard unit has two inputs and twenty-four outputs.